Effects of issue and poll news on electoral volatility: conversion or crystallization? 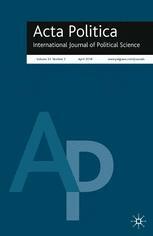 Abstract: In the last decades, electoral volatility has been on the rise in Western democracies. Scholars have proposed several explanations for this phenomenon of floating voters. Exposure to media coverage as a short-term explanation for electoral volatility has of yet been understudied. This study examines the effect of media content (issue news and poll news) on two different types of vote change: conversion, switching from one party to another, and crystallization, switching from being undecided to casting a vote for a party. We use a national panel survey (N = 765) and link this to a content analysis of campaign news on television and in newspapers during national Dutch elections. Findings reveal that exposure to issue news increases the chance of crystallization, whereas it decreases the chance of conversion. Conversely, exposure to poll news increases the chance of conversion, whereas it decreases the chance of crystallization. ← Combined Forces: Thinking and/or Feeling?